As the Vicar of St Giles' Church Copmanthorpe I welcome you our recently renewed website. I hope you are able to find out all you need to know about our small but vibrant church community to the South West of York. We are part of the Diocese of York, one of 43 Diocese that make up the Church of England and we are under the care of the Archbishop of York. I have been Vicar here since 2008 when my wife Claire and daughter Alice, and I moved across the Pennines from Lancashire. We have received a warm Yorkshire welcome and have been forgiven! It was rather like returning home as I had been a student in York and worked for a short while afterwards at the Spurriergate Centre. I then had the privilege of serving God through ministry at the Anglican Cathedral in Cairo, Egypt where I Co-ordinated the ministry to Sudanese Refugees (now known as Refuge Egypt) and had my call to ordained ministry confirmed. I returned to England and served as a Youth and Community Evangelist on the outer city estate of Garretts Green in Birmingham. 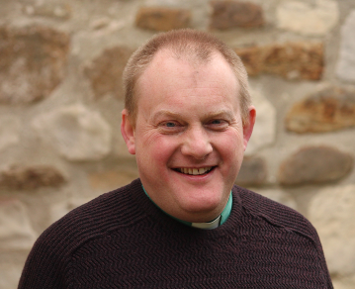 Prior to moving to Copmanthorpe I was a Team Vicar in East Lancashire in the Darwen with Hoddlesden Team Ministry. I had responsibility for St Paul's Church in the village of Hoddlesden and supported the Team Rector at St Peter's Darwen. The churches were part of the Church of England in Lancashire. Having trained for ordination at St John's College in Nottingham, I served my title post at another St Giles' Church - this time in Rowley Regis. I am also the Vicar of the neighbouring parishes of Askham Bryan and Bolton Percy with Colton, and together we make up half of the A6:4 Group of Churches. My wife is a qualified teacher and currently supports students at the nearby York College. My daughter attends Copmanthorpe Primary School, where I am also a Governor and my wife is the Chair of the Friends. We very much feel at home here in Copmanthorpe. Please do not hesitate to get in touch with me if I can be of any assistance. St Giles' Copmanthorpe is the parish church of Copmanthorpe and we are here to serve you. You are invited to worship with us and I look forward to meeting you soon.